Gaming Vision Network: Lost Gems part 1: Turok 1 and 2. The "Lost Gems" articles are a new feature at Gaming Vision to inform you about the great games, hardware, and/or software of the past that you might've missed out on. Today's "Lost Gems" is about Turok 1 and 2 for the pc. Turok: Dinosaur Hunter/ Turok 2: Seeds of Evil for the PC. 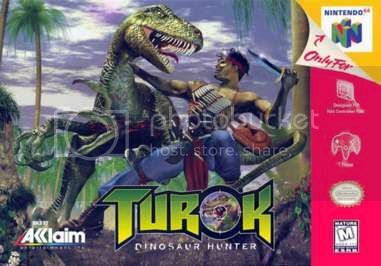 Among the actual good games that Acclaim put out was the first two games in the now defunct Turok series. Both games debuted on the Nintendo 64 which not only showed off the systems amazing graphical powers, but was backed with a unique control setup, a bunch of insane weaponary, intense fast paced action, and offered a great experience not to be missed. Critics raved about the game and honored with it all kinds of awards from publications and websites. The game that started it all for the Nintendo 64. A couple of years later, the highly proclaimed sequel, Turok 2: seeds of evil, was released and expanded upon the original. 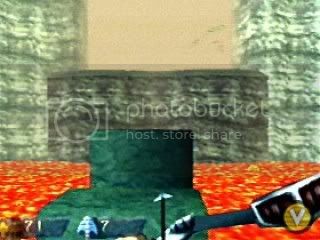 Turok 2 was more action packed than the original and included more weapons, better and sharper graphics( which looked even better when you installed teh Nintedo 64 ram pack), and had a more focused plot. New to the game was the all new split screen multiplayer that included a ton of varied modes including the never-been-copied "monkey tag." 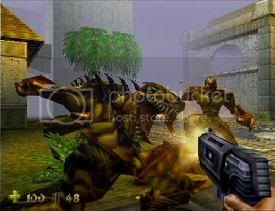 Like it's predecessor, Turok 2 was glorified by many people in the industry and also won game of the year from several publications. Turok 2 had better graphics and was more story driven. Now the big shocker. Both games were also released on the PC several months after their console debuts. The PC counterparts have been hugley overlooked if not completely ignored by the public. Both games were vastly superior to their consoles counterparts which boasted better graphics, better controls and even having online multiplayer mayhem( for Turok 2 only though). Turok 2's online multiplayer mode is right up there with games like the original Unreal Tournament and Quake 3 for its fast paced insane fragfest action. Of course I never knew that both games were even released for the PC until a few weeks ago when I suddenly came upon Turok 1 at my local EBgames. The game was steal with a price tag of $2.99. After getting home, installing it and letting the nostlagia take over I immediately checked around online to see if any more turok games made it to the PC. Sure enough Turok 2 was also ported and I bought one of only 4 copies that were available on Amazon.com. After recieving my copy a week and a half later I happily trouncing my way through the game and experience Turok 2's online multiplayer, which to this day, has a small number of people still playing online. I AM TUROK! Master of the Lava Dance! I find that it is within your best interests to find a copy of Turok 1 and 2 for the PC. I guarentee you that both games won't disappoint and isn't only for the nostalgic. If you are looking for a first person shooter that is still stands up against the Halo's and Half-life's and is fun as hell to boot, then Turok Dinosaur Hunter and Turok 2: Seeds of Evil are for you. If not well then just do me a favor and promise to stay away from Turok Evolution. Enjoyed the blog about free ps3 found it very informative. I found a good website which also features free ps3 and free ps3. The link is great for **uk bargains** including Nintendo Wii, PS2, PS3, games consoles and features famous online stores inc Argos, Marks and Spencer, Empire Direct, LX Direct, Tesco, Next. There is also a chance to play online bingo and try your luck at the online gambling sites available inc roulette, poker and fruit machines. I've also found another site for **free soccer links**. Hope you find these sites interesting - all the best!